creepy crawlies and all things nice.. I know I’ve written about the wondrous wilds of Donegal before. How the light shines in such an extraordinary way, as if the sun and clouds are dancing with each other; how the beaches are more spectacular than any tropical paradise I have been too – and empty; how the air energises you to your very bones and then just at the right time tires you to those same bones so you sleep like the dead, the grateful dead. I know all this, yet everytime I come back it takes my breath away, the knowledge returning to understanding and my amazement renews itself and I remember why this is the most beautiful place on earth. Even my girls somehow know with their young years that this is what life is really about. Endless, too short hours running on sand, wind ripping our hair, sun competing for affection on our skin, rockpools bursting with wonder and life and adventure and untold discoveries. Motherhood is momentous – so many roles and feelings and skills and jobs rolled into one delicious word, “Mummy!” It gets said a lot in Donegal. Today I took on the role of David Attenborough, the great knowledgeable master of the animal world. Today we saw 3 stages of tadpoles and caught a frog, we picked caterpillars off the leaves and saw chrysalis and butterflies – we even got to see one of nature’s best shows – a butterfly emerging from a chrysalis, we found starfish, and caught crabs, we poked jellyfish and we ran from the fast incomng tide. Today I was an encyclopedia, and my girls learnt about the wonders of life. This is what Donegal is also about. Beautiful skies. Gorgeous beaches. Luscious air. And most of all – life and living. This entry was posted in Donegal. Bookmark the permalink. 2 Responses to creepy crawlies and all things nice.. Thought I'd delurk from following your blog to agree completely about Donegal. 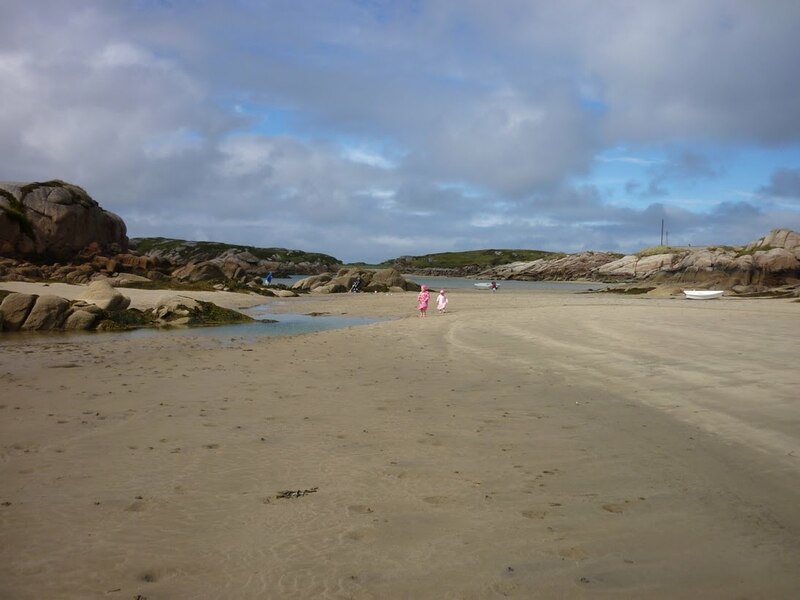 We're just back from a holiday in Donegal and it was wonderful, even with the shed loads of rain! I always remind myself that the unreliable weather is probably part of the reason it's not over run. And so when the sun splits the sky and we dashed for the beach we had it to ourselves. I have lots of family there so visited lots when I was wee, and it's wonderful to go back with my two children. My 3 year old paused as we passed an estate agents to say, “I would really, really, really like an Ireland house.” Great to pass on the love of the place! just lovely! i have to admit i much prefer new england beaches to the southern atlantic ones in the states. so much more to explore, the freshness, crispness, textures and rocks, and the water, usually a refreshing shock to the system rather than something to loll in.